Please refer to our stock # 3496 when inquiring. 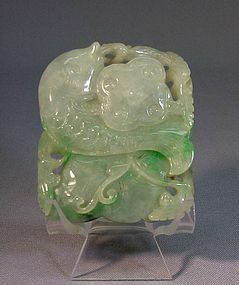 This jade (jadeite) pendant is 2 ¼” long, 1 7/8” wide and 3/8” thick. It is an early 20th century product. It is carved on both sides as a fish with lotus leaf, pod and some small flowers. It has a very nice translucent body and green spots. It is in great condition.